The Dolphin Royal Swim tour gives you the opportunity for a fast-paced action adventure of swimming with dolphins. You'll experience the thrill of being pulled through the water while holding onto the dorsal fin of a dolphin and the foot push maneuver in which two dolphins will lift you to the water's surface. While on your magnificent Grand Cayman vacation, you'll want to take advantage of a once in a lifetime opportunity to get up close and personal with the most beautiful marine life on our Dolphin Royal Swim—dolphins. The action and speed of this tour is exhilarating. Not only will you swim alongside dolphins in the gorgeous waters of the Grand Cayman Islands, you'll have the most action-packed adventure as you're taken on the ride of your life while holding onto the dorsal fins of dolphins. Also included in the tour is the famous foot push, the move you've surely seen in which two dolphins will raise you to the water's surface by pushing on the soles of each of your feet. You'll end your visit as the dolphins give you a hug, kiss and a handshake. Once you've completed your dolphin experience, unwind in the relaxing and lovely surroundings of our Grand Cayman facilities. These British Islands are a true gem of the Caribbean. Each tour participant will receive a kiss, hug, and handshake from our dolphins. Hand targets, dorsal tows, and foot pushes are also included activities in this package. Facilities include use of the lockers, showers and restrooms. Please note that all children must be in the company of a paying adult while swimming. Transportation to our Cayman Island facilities is not included in the package price, nor are meals, beverages or photos. 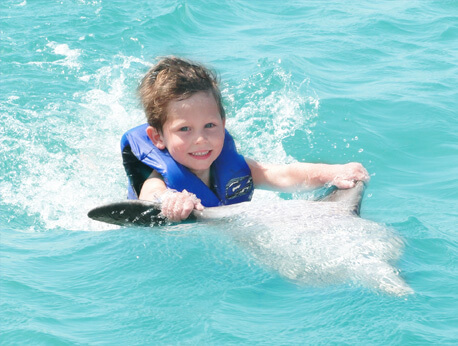 Admission to the Turtle Farm and any addition activities are not part of the Dolphin Royal Swim package price. You must have a passport in order to visit the Grand Cayman Islands. Dolphin Discovery accommodates groups of no more than 10 in order to offer the most personal experience, and you must wear a safety vest during any of our programs. Women who are beyond five months pregnant are not eligible to participate in our programs. However, the Encounter program is suitable to those less than five months along with the signing of a waiver. Be sure to wear biodegradable sunscreen,bring along towels, and convert your dollars to pesos for cash. Give us a call to discuss possible accommodations for any other health issues or physical limitations.